How is it that a select few athletes and teams are able to accomplish things that some see as impossible? What does it take to achieve athletic success and “beat the odds” even when facing tough adversity? Are there key features, special traits, or certain perceptions that successful athletes have that increase their overall chance of athletic achievement? It is these questions, and more, that Kirk answers in his inspirational speaking presentations for athletes, parents and coaches. As a normal, everyday, mediocre student athlete, Kirk knew nothing of sports success beyond just competing for his high school team. His first three years of high school athletics were, shall we say, uneventful, to say the least. However, a dramatic change took place near the end of his junior year, something that altered his life forever. It is this true story, along with others, that Kirk brings to life for his audience, shattering any doubt that they themselves are capable of similar feats of success. A tale of “no you can’t,” “yes I can;” no one leaves his presentation without knowing they are capable of more!!! Kirk’s story of overcoming adversity demonstrates for parents the type of internal ingredients necessary for success in the athletic arena, along with their relationship to success in life as a whole. Inspiring personal thought simply through the presentation itself, parents question what their role is for lending help and guidance to their young athletic offspring. The importance of support and encouragement are only a small part of the story that parents take away from the personal attention Kirk gives to attendees through the conversation and themes he presents. Coaches especially relate to the stories of insurmountable odds Kirk tells, the concepts he presents, and the connections Kirk draws to the inspirational films he uses to support his points. Things all coaches are trying to instill in their athletes. Goal setting, training principles, and thought processes demonstrated through Kirk’s presentation motivates self-reflection and out-of-the-box thinking for coaches, helping them develop new creative ways to inspire the athletes under their direction. Learn more about having Kirk speak. 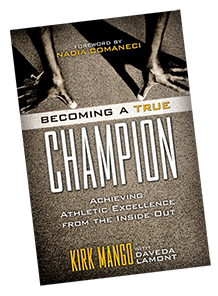 …a story of true rarity, he focuses on success as a product of pure inner will and determination giving a real life perspective to any high school athlete. A must see presentation for any athlete looking to improve their potential both on and off the field. 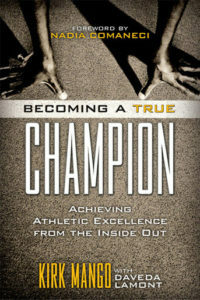 Kirk has the unique ability to share his amazing personal story of athletic triumph relating it to the needs of today’s athlete. …a message of hope, inspiration and courage for aspiring athletes and an assertion of possibilities, outcomes and commitment for coaches. Coach Mango is a tremendous inspiration to young athletes. He is a living example of how hard work, iron determination, and self-confidence can turn an average athlete into a champion in the truest sense of the word. Kirk’s enthusiasm for doing your best on your own behalf or on your team’s behalf is inspiring. 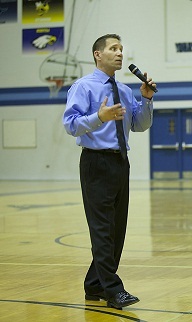 Student athletes benefit from his words of encouragement. …he touched an emotional chord with my cross country team. Kirk’s message is applicable to any sport or team situation where athletes are required to possess dedication and a self-motivated work ethic. Kirk invites every high school athlete to enter into his story no matter where they are in their own athletic accomplishments. Students leave Kirk’s presentation knowing the power of choosing excellence and how this choice shapes their future. Kirk’s use of inspirational videos about real athletes overcoming major challenges sets this presentation apart from all other motivational speeches. Student-athletes leave this presentation forced to look deep within themselves.